Learn about two recent approvals in Prince William County — a 56 executive-style home rezoning in the Brentsville Magisterial district, and a special use permit approval for the Mountcastle Turch Funeral Home. 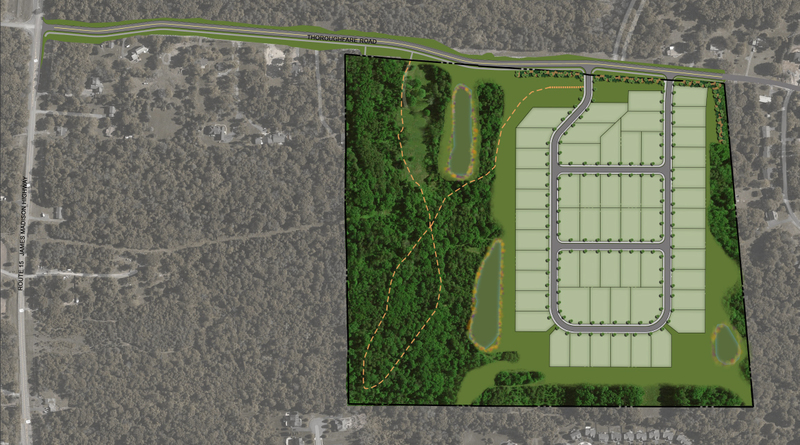 Pete Dolan and Jessica Pfeiffer worked with Equinox Investments on this rezoning from A-1, Agricultural, to SR-1, Semi-Rural Residential Cluster in the Brentsville Magisterial District. The rezoning allows for 56 homes to be constructed. The property, which is approximately 88 acres, is located along Thoroughfare Road between its intersections with Route 15 and Old Carolina Road. The proposal includes significant transportation improvements to Thoroughfare Road which, in parts, is a gravel road today. Other improvements which will prove to be a significant benefit to the community include a large conservation area encompassing nearly 40% of the site (34.2 acres), and more than a mile of trails and sidewalk connections both on-site and off-site. These amenities will continue the theme of environmental protection and public enjoyment along this western corridor of the County. The Prince William Board of County Supervisors approved the rezoning on February 12, 2019. Numerous adjacent property owners, community members and Thoroughfare Road residents spoke in support of the rezoning. Jonelle Cameron and Marian Harders worked with Mountcastle Turch Funeral Home and Crematory, Inc. (“Mountcastle Turch”) to obtain a special use permit to add a crematory to their Occoquan Road facility in Prince William County. Mountcastle Turch has been in operation at their Occoquan Road facility since 1963. Mountcastle Turch also operates a facility on Dale Boulevard which has handled the cremation services for both locations. Until recently, the Applicant only needed one crematory for both locations. However, the crematory services portion of the business has increased in the last few years. In fact, cremation is currently over 40% of the business. On January 22, 2019, the Prince William Board of County Supervisors approved the special use permit. Approval of this special use permit application at the Occoquan Road location will allow for the Applicant to not only stay relevant in the cremation business but, more importantly, allow the Applicant to continue providing cremation services in the Prince William community.